The 2016 supply-side reform of China coal industry, with focus on decapacity and 276 workdays, has brought significant changes on domestic coal landscape: over 300Mt/a of coal capacity closed, declining coal output and stock, soaring prices and higher-than-expected imports, which has attracted great attention of market players and observers both home and abroad, and they have expressed deep concerns for the effect and direction of China's decapacity policy. 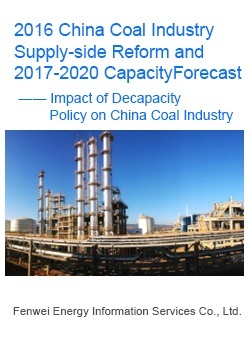 In order to clear doubts of those that are interested in China coal market and show them the direction of China coal industry reform, Fenwei hereby produces this special study report on "2016 China Coal Industry Supply-side Reform and 2017-2020 Forecast", based on our proprietary coal mine capacity database, and expert conclusions and policy interpretation. The report will be presented in form of PPT.